Premier Nutrition Premier Protein Bar - 5 Bars (Peanut Butter Crunch) for $5.58 at Amazon! Premier Nutrition Premier Protein Bar - 5 Bars (Chocolate Peanut Butter) for $5.58 at Amazon.com! At 30g protein and 270 calories per bar, these pack a punch. The issue is that the primary source of protein is soy protein isolate (followed by whey isolate then concentrate), which we’re cool with, but not in too heavy of doses. One bar per day is fine. Your carb/binding sources are Glycerin, Sugar, Hydrolyzed Gelatin, and later down, inulin. Watch Mike and CJ’s Premier Protein Bar Review – long story short, chocolate mint is phenomenal, peanut butter is pretty good, and salted caramel is almost… tasteless! Premier Nutrition Premier Protein Bar - 5 Bars (Peanut Butter Crunch) for $5.58 at Amazon.com! 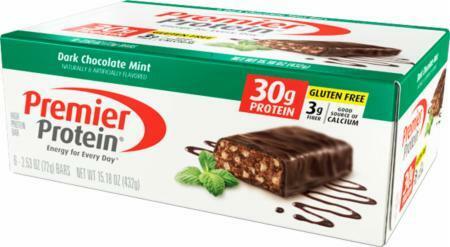 Premier Nutrition Premier Protein Bar - 5 Bars for $3.48 - $3.91 at Amazon! Premier Nutrition Premier Protein Bar - 5 Bars (Chocolate Peanut Butter) for $3.91 at Amazon! Premier Nutrition Premier Protein Bar - 5 Bars for $5.58 at Amazon! Premier Nutrition Premier Protein Bar - 5 Bars (Chocolate Peanut Butter) for $5.58 at Amazon!